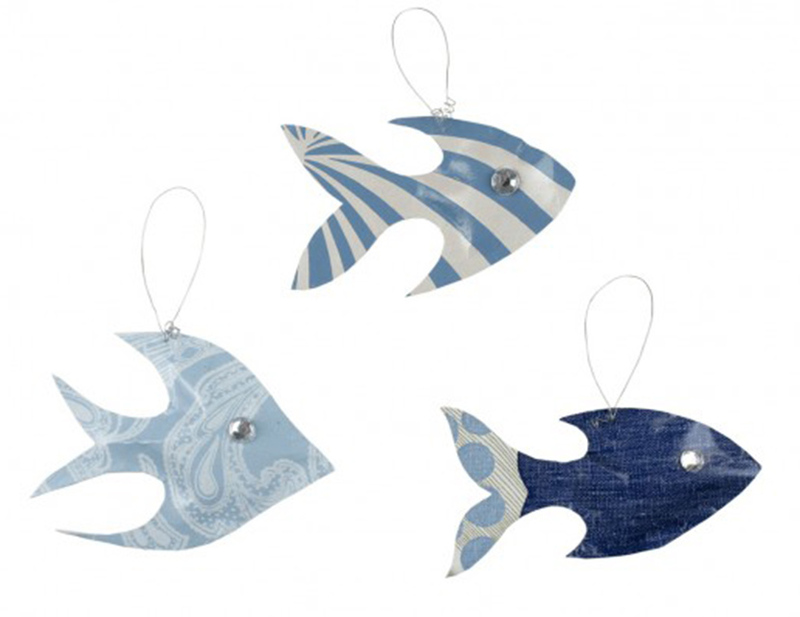 These sweet little fish decorations are perfect to hang from windows, shelves or to decorate an outdoor area in the summer months. They’re a great way to use up all those odds and ends of wallpaper that always seem to be hanging around for years after redecorating and because you’re using your own wallpaper you know that they’ll go with your room theme! If you’ve made extra then why not use them as little extra trimmings for presents. Attach them with the gift tag for an additional little gift and to make your wrapping skills look extra impressive. Before you start make sure to pick pretty crystal colours that match your wallpaper in tone or colour. 1. Choose some wallpaper remnants, at least 20cm square. 2. Fold in half with the patterned side on the inside of the fold and draw a fish shape on the reverse side of your wall paper. 3. Cut out whilst still folded so that you have two fish pieces exactly the same shape. 4. Glue around the outer edge on the reverse side of one of your fish shapes, leaving an unglued gap of 5cm. Then mach up the reverse side of the other fish and stick them together. 5. When dry fill the fish with stuffing to give it a 3D feel, then glue the remaining 5cm gap. 6. Allow to dry then spray 3 coats of varnish on both sides, allowing to dry between each coat. 7. When dry, poke a small hole through the top of your fish and thread a wire through the hole, spiral the ends to make a neat finish. Complete by sticking a clear Swarovski crystal rhinestone on either side for the eyes.